Thrissur Pooram is celebrated on 21st April 2013. It is the biggest pooram festival in Kerala. The Live online webcasting and telecasting is available on all major Malayalam websites and TV channels. Read the below article to know more on Thrissur Pooram and how to get the live actions. Thrissur pooram is one of the most popular and the biggest pooram festival in Kerala. It is considered as the Pooram of all Poorams (mother of all poorams). Thrissur pooram is held at Vadakkunnathan temple in Thrissur. Every year a huge crowd including tourists from different parts of the world gather here to celebrate this Pooram festival. This year (2013) Thrissur pooram is celebrated on 21st April. The participants of the Thrissur Pooram are the Thiruvambady Bhagavathi and Paramekkavu Bhagavathi, Nethilakkavu Bhagavathi, Karamukku Bhagavathi, Ayyanthole Bhagavathi, Laloor Bhagavathi, Choorakkattukavu Bhagavathi, Chembukkavu Bhagavathi, Panamukkumpally Sastha, Kanimangalam Sastha. Chamayam. Elanjithara Melam, Kudamattom, Vedikettu (fire works) and Vida Chollall are the major events of this festival. Chamayam is a sort of dress display conducted on the previous day of the festival at venues close to the Vadakkumnathan temple in the heart of Thrissur town. Elanjitharam Melam is a musical display by some of the most experienced musicians of Thrissur and the neighboring. Vedikettu is the most exciting event. This non stop fire work lasts upto 3 hours. The most notable feature of this festival is that all people from Kerala, with no difference in caste and community, participate to make it a remarkable one. The live moments of the greatest pooram of kerala are available on both internet and television. The live telecasting is available on all major Malayalam television channels including Asianet, Kairali, Amritha and Manorama. You can also watch the live actions from your computer with a internet connection. Below are some of links from which you can get the live webcasting of Thrissur pooram. This 36 hours extravagance ends with a spectacular fire works display which is held on the next day early morning after the pooram (on 22nd April early morning). Railways have provided one-minute halt for several trains at Punkunnam on April 21 and 22 in connection with the Thrissur Pooram. Also Kannur-Shornur (Train No 56602) passenger will be extended to Thrissur on April 21st. Read this article to know about the complete details of Srikrishna Janmashtami 2011, the significance, rituals, procedures and cultural activities. As this name suggests it is the birthday celebration of the divine Lord Krishna who is a personified example of a friend, a guide, a philosopher, and lover or as a child, by his devotee. Janmashtami is an important day for the devotees of Lord Krishna, as the festival celebrates his birth which falls on 22 August, 2011. 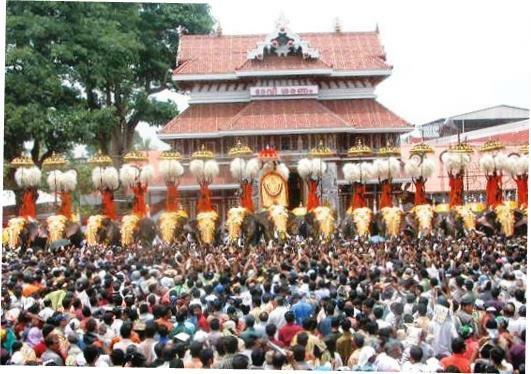 Watch Uthralikkavu Pooram 2013 live streaming online on 26th February from 7 AM onwards. The Uthralikkavu Pooram is a famous festival which is celebrated annually. Major attraction of Uthralikkavu Pooram is its fireworks. Watch Uthralikkavu Pooram festival, fireworks etc live on http://www.wadakkancheryvision.com/. Koodalmanikyam temple festival 2013 details are given here. Koodalmanikyam temple is one of the famous temples Kerala. It is most important temple in Kerala which is dedicated to Lord ' Bharatha'. This temple is a part of Naalambala darshanam. Koodalmanikyam temple festival 2013 starts from 23rd April with flag hoisting. Read the below article to know more about Koodalmanikyam temple and its 11 day long festival programs..
Watch Attukal Pongala 2013 live streaming online from Attukal Bhagavathy temple on 26th February from 7 AM onwards. The Attukal Pongala is a famous festival which is being celebrated annually has already reached the name in the Guinness Book of World Records being the largest gathering of women in the world in a single place in a day. The 10 days festival which began on 18th February will be concluded on 27th February 2013.